You?? ?d Breed Your Mare to My Horse? Really? Eating an apple politely is one trait that helps make Danny a perfect gelding. I am still utterly confounded over the fact that Danny, who I acquired in October, was a stallion until shortly before I bought him. I know that “some people” (note that I use quotation marks for eyebrow-raising effect) like to keep their male horses intact because they like a certain swagger to their horse’s demeanor. But Danny was actually bred to mares! He sired at least a dozen registered Paint foals! And I’m told there are at least a half-dozen more unregistered ones galloping around somewhere! (Note that I use exclamation points for yet more eyebrow-raising effects). It’s not that I don’t love Danny. I do. He’s proven incredibly trustworthy under saddle despite encountering some rather challenging situations. And he’s just a doll on the ground. But breeding material? Not so much. Sure, he’s a black overo, a rare color and pattern combo that’s prized. And he’s tall with a long neck and a big stride. But none of his four feet match. In fact, he’s a tidge club-footed on his left hind, a fault my farrier is working on to improve. Danny also has a longish back, a high tail set that looks a little Saddlebred-ish, movement that resembles the worst dressage horse I ever rode (yes, I’m talking about you, Dreamcatcher) and a lackadaisical attitude toward exercise. Such a deplorable work ethic is great for pleasure riding but it would lead to endless frustration in the performance horse world where, God forbid, a horse is expected to occasionally put forth some amount of profound physical effort. In other words, who on earth thought that Danny—my Danny, the one who slobbers apple goobers on my arm, repeatedly rolls in poop and is never in any hurry to pick up the canter lest he break a sweat—would be a suitable sire? My mind, it boggles. In a rare moment of unbridled enthusiasm, Danny breaks into a gallop. For a few strides, at least. Maybe that’s what makes the horse world go ‘round. Everyone has their ideal vision of equine perfection, although I’d like to think that we can all agree on a few criteria that makes a horse a fine representative of its breed or type. For me, I think I know what Danny is. He’s a flashy horse with a kind disposition and comfortable gaits. He won’t win any prizes in the show ring, but he’s a suitable backyard horse for recreational riding. In other words, he’s the perfect GELDING. (Capital letters for resolute arm-folding/head nodding effect). Oh yes, I am just floored at the advertisements for stud services out there. Studs that should be GELDED! Yuck. I was told of a lady who refused to geld her horses because she prefered the way a stallions neck looked. What a reason to leave a colt intact huh. AWESOME! There are far, far, FAR too many “stallions” that would be better off — and happier! — being geldings. Same with dogs. Men need to check their egos at the door when it comes to four-footed animals. as my mother often says – “That one needs to be OUT of the gene pool!” Your boy sounds like a sweetie, but with all the greats out there, wow. But its so true – my neighbor has two black overo studs, with no papers! I wish people had more sense. Does he have impressive bloodlines. 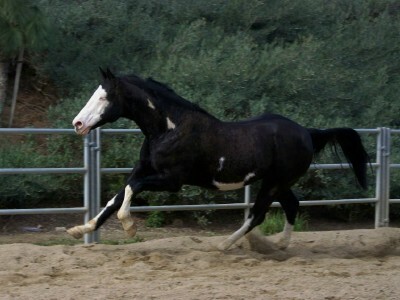 Just wondering because hes big for a paint horse and that can be a problem for him later(not being big haha). I’m with you. There are far too many horses in the world and many of them are neglected and starved because people cannot afford the ones they do have. I’ve vowed never to breed our two mares. There are too many horses that need good homes and when the time comes to get another horse I will be looking for one that needs a good home. THANKS FOR THE COMMENTS. AS ALWAYS, I LOVE TO READ THEM! I AGREE THAT THERE ARE FAR TOO MANY HORSES (AND DOGS AND KITTIES) OUT THERE THAT ARE BRED WITHOUT ANY FORETHOUGHT. THERE SIMPLY ISN’T ENOUGH HOMES FOR EVEN THE BEST, MOST PERFECT SPECIMENS, LET ALONE THOSE THAT HAVE SOME KIND OF CONFORMATION, MOVEMENT OR BEHAVIORAL FAULT. AS FOR DANNY’S BLOODLINES: HE DOESN’T HAVE ANY ‘IMPRESSIVE’ IN HIS BLOODLINES. WITH HIS SIZE, I THOUGHT FOR SURE HE’D HAVE A LOT OF THOROUGHBRED SOMEWHERE, BUT IT’S ALL QUARTER HORSE AND PAINT LINES. ALTHOUGH THE WAY HE’S BUILT, AND WITH HIS HIGH TAIL SET AND LONG ARCHED NECK, I’M CONVINCED THERE WAS EITHER A SADDLEBRED OR FOXTROTTER WAAAAAY BACK THERE IN SOMEONE’S PASTURE… IF YOU KNOW WHAT I MEAN. Kudos to you! 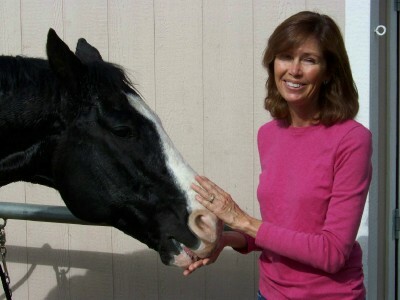 He is a nice gelding and I am sure a wonderful companion. We need to be responsible and stop overbreeding. Too many good horses meet a terrible fate due to overbreeding. He reminds me of my Paint. Mellow and a great pet and pleasure horse, but for a Dash for Cash baby she surprisingly would rather walk than break a sweat! I don’t care what breed he is…he’s a beauty! I agree with the writer. 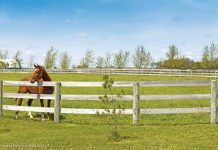 Most stallions should be gelded. Especially ones kept for pleasure. There’s no sense into keeping a horse for breeding if he’s got some genetic faults. In fact it’s doing everyone a favor to help strengthen the genetic pool and to keep the horse population down. I’m glad Reagan was gelded. He’s such a patient horse, but I think his calm demeanor is from being gelded.